1. What is the history of Island Components Group? 2. What are your quality and reliability standards? 4. How do you differentiate yourselves from your competition? 5. How do your prices compare with manufacturers of standard electromechanical components? 6. Which magnet materials do you use in your products? 7. Do you recommend embedded magnets or cemented magnets for motor design? 8. What lubrication methods do you use in designing your products? 9. What are your capabilities in electronics circuit design, validation and software, and motor drive circuitry & controls? 10. What feedback devices do you use in your actuators, in-line packages and mechanisms? 11. What types of optical encoders do you use? 12. Summarize your manufacturing, engineering and testing services. 13. What types of motors do you make? 14. What are the benefits of a brushless motor design? 15. What are the main differences between brushless DC motors and wound field DC brush motors? 16. What are the reasons for using an outside rotor vs. inside rotor? 17. Do cube-shaped motors and cylinder-shaped motors perform differently? 18.Do you use asbestos in the friction pads in your brakes and clutches? 19. Are your brakes able to slip continuously? 20. All your clutches use 24 VDC. Can you design one with 48 VDC? 21. Do you offer brakes mounted on the back of a motor? 22. What applications are your actuators used in? 23.When do you incorporate gearheads in your packages? 24.I need your GHD-022 gearhead but my load is 30% higher than you specify and I don’t have any space for the next size unit. 25. Your catalog shows only one size planetary gearhead. Do you have another catalog with a complete line of gearheads? 26. I’m using your GHF gearhead series and sometimes my equipment jams and breaks the teeth in the gearhead. What can I do? 1 What is the history of Island Components Group? We are management-owned and started in 1991 as a manufacturer of AC motors for the military. Over the years, we have diversified and currently, commercial and military aerospace and industrial applications such as medical, down-hole drilling and undersea research account for more than half of our total sales. We design and manufacture a broad range of brushless and brush type DC motors and controllers, induction, synchronous, hysteresis and other precision motors, electromagnetic brakes and clutches, sensored and sensorless drives, rotary and linear actuators and precision windings. We conduct ongoing applied research in the areas of flight control actuation, optical scanners, blowers, medical, robotic, textile, polishing and grinding, aircraft environmental control, utility traction and specialty products, including electrical power generation. Aerospace and military applications require the highest quality and reliability. We are certified to ISO9001-2008 and meet MIL-I-45208 quality procedures. We have completed the initial stage of our continuing Lean Manufacturing journey. We perform soldering certified to the IPC-A-610 program and ESD (Electro Static Discharge) trainer and conduct our soldering and ESD training in house. Certifications and certificates are issued to persons who sucessfully complete the classes. We have a Parts Manufacturer Approval(PMA) for the Federal Aviation Administration(FAA). Aerospace contractors such as Boeing, Lockheed Martin, Moog, Eaton Aerospace and others rely on our quality and reliability to provide solutions for their critical flight-control applications, radar, electro-optical drives and other control systems requirements. Our engineering and manufacturing facility and administrative offices are located on Long Island, beside Islip’s MacArthur Airport. We offer design engineering, precision parts manufacturing, assembly, qualification testing, product support, administration, sales and marketing and applied research from our facility. By our ability to find the optimal cost-effective solution, usually by modifying one of our existing designs or creating a new design. 5. How do your prices compare with manufacturers of standard products? An off-shelf design usually is less-expensive than a customized design, which typically involves one-time design and development costs. When we are in the production phase, however, our manufacturing efficiency, offshore sourcing of labor-intensive parts and management ownership enable us to offer pricing comparable to standard products. In addition, our optimal solutions often improve system performance and reduce system downtime, which creates considerable savings over the life of the system. We use Alnico, Samarium Cobalt and Neodymium magnets, each of which has advantages and disadvantages depending on the application. Alnico, whose main advantage is temperature stability, was the best material available several decades ago but Samarium Cobalt and Neodymium magnets have emerged since then and are in widespread use today. Neodymium offers the highest possible energy; however, it is limited to 150 degrees C and can develop corrosion problems in some environments, if not coated. Samarium Cobalt is a stable high-energy magnet whose early stability problems have been resolved. There are also cost differences between magnet materials. Your best bet is to speak with one of our design engineers who can address your particular needs and discuss magnet choices with you. An embedded magnet is easier from the manufacturing point of view, because the magnets are easily slid into the slots as the motor is assembled. Motor speed and performance is important to consider, as cemented magnets can sometimes fly off at high motor speeds if not encased in a sleeve. 8. What lubrication methods do your use in designing your products? Various lubrication methods can be used, depending on speed, temperature, range and performance requirements. Our bearings are normally used for the life of the product. a 36 slot, 42 pole concentrated winding brushless DC motor design offering exceptional mechanical stability, low manufacturing cost and low noise and vibration when excited with sinusoidal voltage drive electronics. EMA output of 10,000 inch pounds over 90 degrees rotation in approximately two seconds with a gearbox ratio of 25:1 and minimum gearbox efficiency of 55 percent of torque. an open loop controller, designed using C++ and the Metrowerks complier, with much of the software written and tested on a PC platform using the Unified Modeling Language to organize it into visual documents to be shared by the software design group. The design platform was then moved from the PC to development boards. The controller gives read-out of open/closed position and changes in rpm, acceleration, power variable and slope in speed and acceleration. Following a change of valve position, the controller can “power down” as active position control is not required. 10.What feedback devices do you use in your actuators, in-line packages and mechanisms? We use resolvers, synchros, encoders and sensors of various kinds. Our motors can also be slotless, depending on the controller. 12: Summarize your manufacturing, engineering and testing services. We provide advanced design capabilities, cost-efficient manufacturing and superior customer service. We have all the engineering disciplines required for designing complex small actuation systems. We provide prototype modeling to a fully functional prototype. We maintain a prototype system and dedicated model shop to provide you with a complete understanding of your electromechanical actuator prior to production commitment. We have long-established relationships with offshore windings suppliers. We are a valuable resource during the early stages of design development. Limited rotation motors can be used to control or move elements that only require limited rotation. These motors provide very linear torque and high acceleration and are ideal for limited movement applications where space is critical and there is not enough room for a full sized round motor. These devices are supplied as a parts-set and are intended for using existing structures as their supporting elements. This concept reduces the total mass of the complete assembly by eliminating redundant support structures, and reduces total system cost. A linear motor is essentially a rotary electric motor laid down on a flat surface. Since the motor moves in a linear fashion to begin with, no lead screw is needed to convert rotary motion to linear. While high capacity is possible, the material and/or motor limitations on most designs are surpassed relatively quickly. Most linear motors have a low load capacity compared to other types of linear actuators. These motors are designed for use in high-speed, continuous operation applications, where they operate with low noise levels, low heat and high reliability. Electronic commutation ensures exceptionally long life and speed control over a broad range. Efficiencies of 80-90% are achievable. 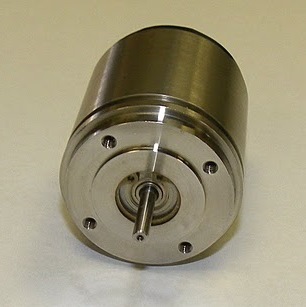 We can custom design these motors to meet your specific motor requirements. They are available as housed units and rotor / stator part sets. Toroidally wound brushless DC motors provide constant, ripple-free torque sustained through the required angle. They are preferred in many applications such as incremental motion and control instrumentation applications, where eliminating the slot cogging effect is desirable. In addition, lower rotor inertia motors may be substituted where a high mechanical time constant was incorporated to filter torque ripple. Our toroidally wound motors are used primarily in connection with development of smaller and more inexpensive motor controllers, which can be designed as an integral part of the motor. Our sinusoidally wound motors provide constant, ripple-free torque sustained through the required angle. Eliminating the slot cogging effect makes sinusoidal designs desirable in many applications, especially in incremental motion systems and in the field of control instrumentation. In addition, lower rotor inertia motors may be substituted where a high mechanical time constant has been incorporated to filter torque ripple. Our low-noise brushless motors come in diameters from 1.5 inches to 4 inches and lengths from 1.5 inches to 5 inches or longer. They offer continuous torques from 30 to 200 oz-inches and speeds up to 20,000 rpm. Built for rugged applications and environments, they feature neodymium rare earth magnets and aluminum housings. Options include electronic drivers, encoders and gearheads, as well as Hall effect, resolver and sensorless feedback. Our brushless DC frameless motors are custom configurable to meet each requirement. Rotor-stator part sets are an effective and economical solution when the customer’s application does not call for or need a fully housed motor. Brushless DC motors with integral electronics provide smooth, quiet and efficient operation over a wide speed range. Each frame size is available in several different lengths with the electronics optimized for the specific motor's operating parameters. We offer designs for a wide variety of applications. These motors provide excellent value and are well-suited for applications demanding high-torque, low audible noise, long life and ease of installation. IP68-rated brushless motors provide smooth, efficient operation and increased speed ranges. Utilizing neodymium magnets, they provide excellent value with their low cost and high torque. Each frame is available in different lengths with a variety of design options to meet a wide range of industrial applications. When the application requires the reliability and performance of a brushless DC motor, yet must operate in a dusty environment or underwater, our IP68-rated motors, featuring anodized aluminum housing and end caps, sealed bearings and high quality sealed connectors, provide a durable and attractive motor package and are a natural choice. Slotless motors provide zero detent torque for near zero vibration. Utilizing Samarium Cobalt magnets and a stainless steel housing, our slotless motors are ideal for medical applications where the motor has to withstand autoclave conditions. Utilizing NdFeB magnets, they provide excellent value with a lower cost and high torque. Our slotless motors are available in custom configurations, including Hall effect feedback or sensorless. In addition, we offer a variety of electrical options for applications demanding high efficiency, high speed, low acoustical noise and zero detent torque. Utilizing high energy sintered neodymium magnets and a unique stator design, this brushless motor offers greater torque capability and is ideal for applications where maximum performance and compact size are critical. Designed for maximum efficiency, this motor is a viable and more economical alternative to traditional brushless DC designs. Stepper motors are closely related in design to three-phase AC synchronous motors, where an internal rotor containing permanent magnets or a magnetically-soft rotor with salient poles is controlled by a set of external magnets that are switched electronically. They may also be thought of as a cross between a DC electric motor and a rotary solenoid. As each coil is energized in turn, the rotor aligns itself with the magnetic field produced by the energized field winding. Unlike a synchronous motor, in its application, the stepper motor may not rotate continuously; instead, it "steps" — starts and then quickly stops again — from one position to the next as field windings are energized and de-energized in sequence. Stepper motors can be rotated to a specific angle in discrete steps with ease. Depending on the sequence, the rotor may turn forwards or backwards, and it may change direction, stop, speed up or slow down arbitrarily at any time. Computer controlled stepper motors are one of the most versatile forms of positioning systems, particularly when part of a digital servo-controlled system. Stepper motors were and still are often used in computer printers, optical scanners, and digital photocopiers. Computer-controlled stepper motors are one of the most versatile forms of positioning systems. They are typically digitally controlled as part of an open loop system, and are simpler and more rugged than closed loop servo systems. Industrial stepper motor applications are in high speed pick and place equipment and multi-axis CNC machines often directly driving lead screws or ball screws. In the field of lasers and optics they are frequently used in precision positioning equipment such as linear actuators, linear stages, rotation stages, goniometers and mirror mounts. Other uses are in packaging machinery and positioning of valve pilot stages for fluid control systems. DC motors are commonly constructed with wound rotors and either wound or permanent magnet stators. Permanent magnet types have some performance advantages over wound stator types, and have become predominant in fractional horsepower applications because they are smaller, lighter, more efficient and reliable. Permanent magnets have traditionally only been useful on small motors because it was difficult to find a material capable of retaining a high-strength field. Only recently have advances in materials technology allowed the creation of high-intensity permanent magnets, such as neodymium magnets, allowing the development of compact, high-power motors without field coils. A universal motor is a series-wound motor designed to operate on either AC or DC power. The current in both the field and the armature (and hence the resultant magnetic fields) will alternate (reverse polarity) in synchronism, enabling the resulting mechanical force to occur in a constant direction. Continuous speed control of a universal motor running on AC is easily obtained by use of a thyristor circuit, while (imprecise) stepped speed control can be accomplished using multiple taps on the field coil. Universal motors are more suitable for applications requiring intermittent high-speed uses and high starting-torque demands. Motor damage may occur due to overspeeding (running at an RPM in excess of design limits) if the unit is operated with no significant load. On larger motors, sudden loss of load is to be avoided, and the possibility of such an occurrence is incorporated into the motor's protection and control schemes. In some smaller applications, a fan blade attached to the shaft often acts as an artificial load to limit the motor speed to a safe value, as well as a means to circulate cooling airflow over the armature and field windings. An AC motor consists of two basic parts, an outside stationary stator having coils supplied with alternating current to produce a rotating magnetic field, and an inside rotor attached to the output shaft that is given a torque by the rotating field. There are two types of AC motors, depending on the type of rotor used. The first is the synchronous motor which rotates exactly at the supply frequency or a submultiple of the supply frequency. The magnetic field on the rotor is either generated by current delivered through slip rings or by a permanent magnet. An induction motor (or squirrel-cage motor) is an AC motor where power is supplied to the rotor by means of electromagnetic induction. In an induction motor, the stator evokes a magnetic field which interacts with the rotor’s emf to produce a resultant torque, henceforth serving the purpose of producing mechanical energy. Induction motors are widely used, especially polyphase induction motors, which are frequently used in industrial drives. Induction motors are now the preferred choice for industrial motors due to their rugged construction, absence of brushes (which are required in most DC motors) and — thanks to modern power electronics — the ability to control the speed of the motor. Synchronous motors are distinguished by a rotor spinning with coils passing magnets at the same rate as the alternating current and resulting magnetic field which drives it. The armature winding, when excited by a poly-phase (usually 3-phase) winding, creates a rotating magnetic field inside the motor. The field winding, which acts as a permanent magnet, simply locks in with the rotating magnetic field and rotates along with it. During operation, as the field locks in with the rotating magnetic field, the motor is said to be in synchronization. Once the motor is in operation, the speed of the motor is dependent only on the supply frequency. When the motor load is increased beyond the break down load, the motor falls out of synchronization i.e., the applied load is large enough to pull out the field winding from following the rotating magnetic field. The motor immediately stalls after it falls out of synchronization. Industrial applications where constant speed is necessary. In synchronous generators when it is important to keep the frequency constant at which the generator is connected. Low power applications including positioning machines, where high precision is required, and robot actuators. Accurate control in speed and position using open loop controls, eg. stepper motors. Their power factor can be adjusted to unity by using a proper field current relative to the load. Also, a "capacitive" power factor (current phase leads voltage phase) can be obtained by increasing this current slightly, which can help achieve a better power factor correction for the whole installation. Increased electrical efficiency when a low speed is required. These motors are used where exact speed (assuming an exact-frequency AC source) as well as rotation with a very small amount of sudden variations in speed is essential. Their rotor is a smooth cylinder of a magnetic alloy that stays magnetized, but can be demagnetized fairly easily as well as re-magnetized with poles in a new location. Hysteresis refers to how the magnetic flux in the metal lags behind the external magnetizing force; for instance, to demagnetize such a material, one could apply a magnetizing field of opposite polarity to that which originally magnetized the material. These motors have a stator like those of capacitor-run squirrel-cage induction motors. On startup, when slip decreases sufficiently, the rotor becomes magnetized by the stator's field, and the poles stay in place. The motor then runs at synchronous speed as if the rotor were a permanent magnet. When stopped and re-started, the poles are likely to form at different locations. For a given design, torque at synchronous speed is only relatively modest, and the motor can run at below synchronous speed. Advances in electronics and power semi-conductors permit cost effective control of a brushless DC motor, which also offers the response and linearity over a wide speed range that is needed for today's applications. Brushless DC motors are usually a bit more expensive and there are many applications where brush motors do a great job and are the smarter choice. It's always best to discuss your particular requirements with one of our engineers. No electrical energy is absorbed by the permanent magnet field excitation system of the brushless DC motor, resulting in substantially increased efficiencies compared with the wound field motor due to losses in the lagging wound field. The elimination of the arcing of the sliding contact and wear of the brushes and commutator of the DC brush motor greatly improves reliability and reduces motor maintenance and RFI with the brushless DC motor. Heat generated in the stationary windings of the brushless DC motor is removed easily through the high thermal conductivity of a metal to metal contact while heat generated in the moving coils on the rotor of the brush DC motor winding is removed with difficulty through the low thermal conductivity of the gas in the air-gap. Thus brushless DC motors operate at higher efficiency and lower temperatures or offer higher power density than brush DC motors. Inside rotor designs provide lower rotor inertia, outside higher rotor inertia. Cube shaped motors lend themselves better to the size of the envelope and offer a high torque to size ratio. 18. Do you use asbestos in the friction pads in your brakes and clutches? We have never used any friction material that contains asbestos. We use different types of proprietary materials depending on the type of application. It depends on energy(heat loss) dissipated. Normally, our brakes are used as holding brakes or dynamic applications where we bring an inertia load to a rest. Contact us to discuss your continuous slip application. We can wind the coil for any voltage, 3VDC to 120 VDC. Because of the different types of motor designs, it’s not practical to have a standard design. We will take any motor from any manufacturer and design a brake for it. We supply rotary and linear actuators for aerospace, defense and industrial applications. Our high performance actuators are used in aerospace flight control applications, commercial and military aircraft, military ground equipment, missiles and munitions and industrial equipment. We design and manufacture all actuation hardware, electronics and software to provide closed loop servo control for a diverse range of applications. For more information on our actuators, click here. Also, see Question 9 for a summary of our recently-designed extremely compact valve actuator and electronics for the U.S. Navy. 23. When do you incorporate gearheads in your packages? When we need to control a large load inertia with a comparatively small motor inertia. The gearhead allows greater control of acceleration or velocity of the load, and without the gearhead, the motor torque, and thus current, would have to be as many times greater as the reduction ratio which is used. Each combination of motor and gearhead offers unique advantages. We offer a selection of windings in each frame size which, combined with a selection of reduction ratios, offers a range of solutions to output requirements. 24. I need your GHD-022 gearhead but my load is 30% higher than you specify and I don’t have any space for the next size unit. With different processes, we can meet your higher loads within the same size unit. Call us to discuss. Because we are a specialty house, we can design any planetary gearhead to your specifications. Call us to discuss. If there is no major design problem and this happens occasionally, we can design a fail-safe slip clutch right into the gearhead without changing the external dimensions.